The Mount Washington Observatory in New Hampshire is one of the oldest weather observatories in the world. 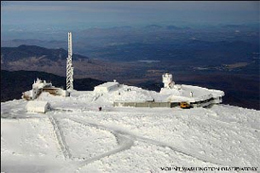 Located in the White Mountains, it is a nonprofit and educational institute whose purpose is to maintain a permanently staffed observatory atop Mount Washington, and to use this unique station and other facilities to conduct programs of environmental observation and technical research. Jakob Odell, data system programmer for the observatory, said, “We have a network of eight different temperature monitoring stations located at various locations around Mount Washington. Each station has a Campbell Scientific 107-L Temperature Probe, a Campbell Scientific CR10X Measurement and Control Module, a Campbell Scientific MSX 10 or 20 Watt Solar Panel, a Campbell Scientific PS100 12 Volt Power Supply with Charging Regulator, and a FreeWave Wireless Data Transmitter Radio (FGR-115RC) with a 900 MHZ antenna. “Vista Data Vision software from Vista Engineering is used to manage and display the data. The ability to access the MySQL database from external queries, and not just through the data browser, has enabled us to display data on our web site and custom displays that are found in several locations in the area. I have received many emails from people who love seeing the temperatures at different elevations, and VDV is what makes continuously updating this page possible. “We needed a way to quickly and easily monitor these files for changes, and compile a database so that we could watch temperature trends at different elevations, as well as the ability to access historical data for scientific studies.